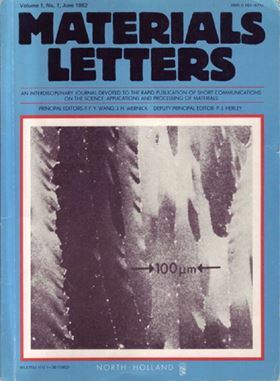 Front cover of the first issue of Materials Letters, showing an SEM micrograph of micro-zone melted silicon thin film from the paper by H.J. Leamy, C.C. Chang, H. Baumgart, R.A. Lemons and J. Cheng from Bell Laboratories, USA, Materials Letters, Volume 1, Number 1 (1982) 33–36. The first issue of Materials Letters was published in June 1982, and so this issue marks the completion of 35 years of the journal. Materials Letters was the brainchild of Frank Wang, then at State University of New York at Stony Brook. He had noticed in 1981 that there was no journal, at that stage, devoted solely to the publication of letters in the burgeoning field of Materials, like Applied Physics Lettersin the applied physics field, and felt that it was time to fill this gap. Together with Jack Wernick at Bell Labs, Murray Hill, he convinced Elsevier, through the North-Holland Publishing Company, of the viability of this idea, and gathered a group of like-minded scientists to form the Editorial and Associate Editorial Board. Jack Wernick was his fellow Principal Editor, and P.J. Herley, also at Stony Brook, was his Deputy Principal Editor. To make the journal truly international, Frank also appointed Corresponding Editors from different countries – Arthur Willoughby from Southampton University, UK, Bernd Hoffmann at Univ of Karlsruhe, Germany, and T. Ninomiya at Univ. of Tokyo. As a new materials journal, Materials Letters was able to embrace all aspects of the science, application and processing of materials of all kinds. The first issue, whose front cover is reproduced here (see image, right) included 4 papers on semiconductors, one on metallic glasses, one on intermetallics, two on electroceramics, and one on thin films. The aim of the journal was ‘to reach and provide a forum for scientists and engineers trained in the traditional disciplines of chemistry, physics, ceramics and metallurgy, now engaged in the interdisciplinary field of the science and technology of materials’. The journal was thus envisaged as being inclusive of all materials sub-disciplines, and this interdisciplinary approach marked an acknowledgement of work which, until that time, would not find a place in single subject materials science journals with a background in metallurgy, ceramics or polymers. This has represented an important contribution that the journal has made to our discipline, right up to the present day. On the retirement of Frank Wang as Principal Editor in April 1989, Jack Wernick continued to lead the journal in his place. By that stage, the publisher’s note in that issue recorded that submissions to the journal had ‘shown a healthy increase’ and publication was now on a monthly schedule. The following year (1990), Arthur Willoughby joined Jack Wernick as fellow Principal Editor. With the continued growth of the journal, Hideo Nakajima, from Osaka University, joined as a third Principal Editor in 2002, giving representation from US, Europe and Japan in the Editorial team. In September 2002 Jack recorded the 20th Anniversary of the journal, and noted, among other comments, that ‘China is the country sending most of the manuscripts, with India running a close second’. He also mentioned the interesting fact that Frank Wang was at Bell Labs, Allentown when the journal began, and that was one of the links between them. After Jack Wernick’s retirement in 2003, Arthur Willoughby and Hideo Nakajima remained as Principal Editors, until Gary Messing from Penn State University, and Heng Qiang Ye from Institute of Metal Research, Chinese Academy of Sciences, joined as Principal Editors in 2004. Later Lasar Shvindlerman from the Institut fur Metallkunde und Metallphysik, Aachen, Germany, made the move from Corresponding Editor to be a fifth member of the Editorial team. After Hideo Nakajima’s departure, Junichi Hojo from Kyushu University, Japan, joined in March 2007 to fill his role, and, in June 2009, T.G. Nieh, from the University of Tennessee, was appointed as a further Editor. The growth of the number of papers submitted to the journal has been exponential in recent years. The first volume of the journal published just 50 papers, while in the year 2010, 797 papers were published and 1896 papers were published last year! To accommodate this, in parallel with the enhancement of the Editorial team, it was fortunate that Elsevier phased in online submission and editorial management, which has enabled us to handle the enormous volume of papers. In parallel with this, the Editorial team was in need of restructuring, and, in March 2010, after Gary Messing and Heng Qiang Ye’s departure, Aldo R. Boccaccini from the University of Erlangen-Nuremberg, Germany, who had been for some time a member of the Associate Editorial Board, was appointed to the role of Editor-in-Chief (EiC). In Feb 2011 Evangelos Manias, from Penn State University, also previously a member of our Associate Editorial Board, was appointed as Editor, while in Jan 2012, the year in which we celebrated our 30th anniversary, Ming Wan, from the University of Hong Kong, joined the journal as member of the editorial team. In tune with the need for publication of focused review articles accompanying the continuous increase of publications in the field, a new type of submissions, called “Featured Letters”, was introduced in 2012. These are short but authoritative invited reports of the state-of-the-art in a given scientific field, without becoming as exhaustive as classical review papers. The last five years have seen a further increase of submissions to Materials Letters which has prompted us to enlarge the editorial team; we have welcomed Jacob C. Huang, National Sun Yat-sen University, Taiwan, Olivia A. Graeve, University of California, San Diego and Ricardo H. Castro, University of California, Davis. Following the departure of Min Wang, Evangelos Manias and T. G. Nieh, new editors joined the journal including Jenn-Ming Yang, University of California Los Angeles, Virginia A. Davis, Auburn University and Iwan Kityk, Technical University of Czestochowa, Poland. In 2015, and following the departure of Jacob Huang, Yufeng Zheng, Peking University, China, who had been a long serving member of the Editorial Board was appointed to the Editorial team. More recently, when Virgina Davis departed, and following the need to cope with the ever increasing number of submissions, three new editors were appointed, namely Raymundo Arroyave, Texas A&M University, Michael Carboni, LHYS Laboratoire des Systèmes Hybrides pour la Séparation, France, and Vladislav Kharton, Institute of Solid State Physics, Moscow, Russian Federation, who had been a member of the Editorial Board of the journal for many years. Kyle G. Webber from University of Erlangen-Nuremberg, Germany, has just joined the journal to complete the current editorial team of 13 editors including the EiC. Materials Letters has now grown to be one of the largest and most recognised materials journals, and, in recent years, the only general materials journal devoted solely to the publication of letters - a vindication of Frank Wang’s original vision! In parallel with this, the Editors have determined to publish papers of only the highest quality, and most significant in impact, with the result that the Impact Factor has risen consistently to its present level at 2.437 (1.299 in 2007 at the 25th Anniversary) – an important achievement for a letters journal! This special anniversary issue includes a selection of 35 regular papers submitted to the journal which cover key areas in which Materials Letters is cementing its position as the journal of choice for rapid publication of cutting edge short reports, including: nanocomposites, biomaterials, advanced processing and multifunctional materials. Finally, and highlighting all the developments over the years, we pay tribute to the continued support by Elsevier, whose staff have made such important contributions to the journal and all our fellow Editors, their assistants, Associate Editors, referees, and authors.